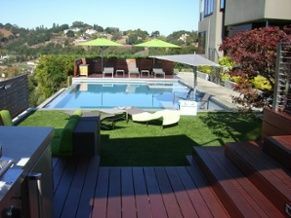 Denver Artificial Grass Pros’ turf adds beauty and recreational possibilities to patios, decks and rooftops. Unlike natural grass, synthetic grass doesn’t need soil so it can be installed anywhere – including your driveway. Our rooftop installations incorporate a tile system that ensures our artificial grass drains completely and efficiently. When it rains, your grass will be dry and usable soon after. Unlike other flooring options, it isn’t slippery when wet nor does it mold like carpeting. Our synthetic grass is thick and soft even when laid over concrete, and all of our Denver Artificial Grass Pros synthetic turf products are pet-friendly. We have even installed rooftop putting greens! 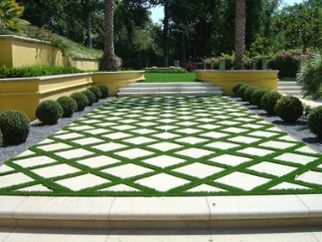 Denver Artificial Grass Pros synthetic lawn is the perfect alternative. It requires little to no maintenance, so you can spend more time swimming and lounging around your pool. It has a natural look and feel and it is not slippery when it gets wet.